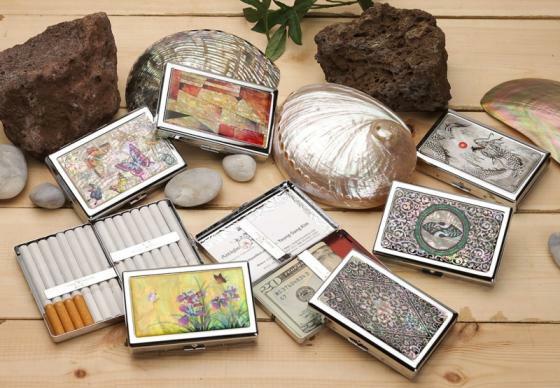 Our stylish cigarette case is ornamented with an intricate mother of pearl design. The elaborate adornment with the iridescence of mother of pearl designs makes it an impressive item for collection. The embossed pattern on the backside and inside surface, which helps prevent slipping, adds beautiful panache to this cigarette case. Antique Alive is the largest provider of mother of pearl arts and crafts in the world. We present unique and stylish mother of inlay scalp massage hairbrushes, wood shoehorns and cigarette cases created by the best artisans with the traditions lasting millennia in Korea. Our products are ornamented with beautiful design and iridescent colors of mother of pearl. They can be used for your everyday life and perfect wedding, housewarming and anniversary gifts for your special someone.